I wasn't able to blog earlier about plans for today although I fully intended to. I'm late in posting because last night I got sick and remained so until a little after noon today. Tonight Larry and I went on a double date with our friends, Bernie and Lisa Currie, from church. It was a mother's day gift to Lisa and I, and we had dinner at Maggiano's and then saw Amy Grant in concert! It was amazing. Amy sang some new songs that she just wrote for her album that will be forthcoming and they are AMAZING...so deep lyrically. Some of Amy's best work. I am so excited for the project to come out so I can load these songs onto my Zune. I am so thankful and blessed for this great evening and I take joy in him doing something so wonderful for me. Thanks babe! Color me jealous!!!! 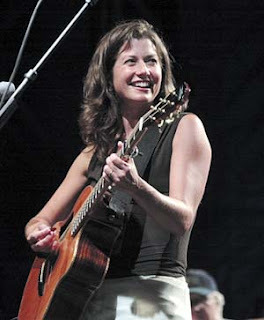 It's been 20 years since I saw Amy Grant in concert..I still have grand plans to visit Nashville and eat at the Pancake Pantry. I've heard she and Vince eat there a lot, lol! Awesome gift! :-) So glad that you felt better! oh so jealous here! Amy is awesome. I love her voice! What a great gift! kudos to Larry!